1. Total Spending for next Tuesday's election for the State Supreme Court between current Justice Patience Roggensack and challenger Ed Fallone, a Marquette University Professor of Law, is not expected to reach the $5-6 million spent in Wisconsin Supreme Court elections in 2007, 2008 and 2011. But the partisan political divide -- including the outright endorsement of one of the candidates by a state political party in what is supposed to be a non-partisan and impartial office -- has never been more pronounced. Bill Lueders of the Wisconsin Center for Investigative Journalism, has this analysis of the Roggensack-Fallone contest. The Brennan Center for Justice reported earlier this week that outside spending in the race had broken heavily in favor of Roggensack. 2. Louisiana does it. Alabama does it. Even Oklahoma and New Jersey do it. Let's do it. Let's require Wisconsin legislators to refrain from lobbying their former colleagues for a couple of years before cashing in. (With apologies to the late, great Cole Porter). Most states have realized the wisdom of passing laws that require legislators to refrain from lobbying and strong arming their former colleagues immediately after leaving office and for a period of one or two years. Why? Because not doing so feeds the public perception that some legislators utilize their positions of power and influence in elective office to then, "cash in" on their former position and contacts as lobbyists. Even worse is the perception that some legislators may actually adopt a particular position on an issue while in office and then be rewarded later with a better paying lobbyist position. Even the U.S. Senate and U.S. House of Representatives require a cooling off period before ex-Senators and ex-Congressmen or women can lobby their former colleagues. In Wisconsin, the Legislature some years ago passed a law requiring a year cooling off period for top executive branch agency officials. But the law exempted legislators. The issue was first highlighted when former Assembly Speaker Jeff Fitzgerald left office in January and almost immediately registered as a lobbyist for School Choice Wisconsin. It has flared up again with the state budget proposal by Wisconsin Governor Scott Walker to expand the voucher program that would force Wisconsin taxpayers to pay for more non-public schools. Fitzgerald joins two other former Republican Assembly Speakers who have lobbied for the school choice forces -- John Gard and Scott Jensen. For more on this intersection of power, influence and campaign cash in Wisconsin politics, read this article and view this TV report. 3. 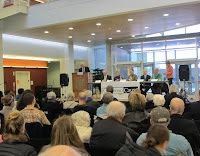 Approximately 100 citizens and students braved snow and the cold to attend CC/WI's most recent reform forum, in the beautiful Science Center Atrium at Beloit College. 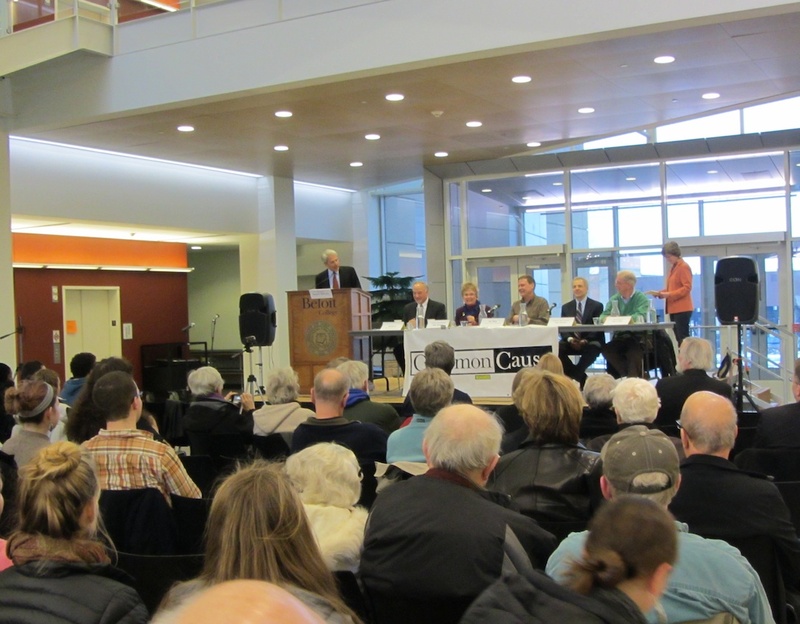 Panelists at the forum included State Senator Tim Cullen (D-Janesville), former State Senators Tim Weeden (R-Beloit) and Judy Robson (D-Beloit), Beloit Daily News Editor Bill Barth and CC/WI Director Jay Heck. The evening was moderated by Beloit College History Professor Beatrice McKenzie and welcoming remarks were made by Beloit College President Scott Bierman. The discussion among the panelists and audience was spirited and, at times passionate, as a variety of different views about political reform were aired and debated. There did seem to be a consensus among almost everyone who attended that Wisconsin needed redistricting reform for 2021 and that it ought to be based on how Iowa does redistricting. There was also agreement about the need for disclosure of the donors to outside spending groups that now dominate state and federal elections as a result of the Citizens United vs. F.E.C. decision issued by the U.S. Supreme Court in 2010, which reversed a century of settled law and precedent and opened the floodgates for corporations, unions and wealthy individuals to be able to spend unlimited money to influence the outcome of state and federal elections. Other issues aired were Wisconsin's extreme and overly restrictive photo voter ID law, whether we should elect or appoint Wisconsin Supreme Court Justices and public financing of state elections. For more on the forum, read this news report. 4. At the most recent meeting of the CC/WI State Governing Board last month, two pro-reform former legislators who left the State Assembly in January, were elected to the Board: Donna Seidel of Wausau and Kelda Helen Roys of Madison were Democratic lawmakers. A former Republican Cabinet Secretary and former Republican State Senator will join the CC/WI Board this Spring and Summer. For more on this, go here. Also at the February 21st CC/WI Board Meeting in the Capitol in Madison, State Representative Kathy Bernier (R-Chippewa Falls), the Chair of the Assembly Campaigns & Election Committee addressed the board about her plans for the 2013-2014 legislative session. Also addressing the board were State Senator Dave Hansen (D-Green Bay) and State Representative Mandy Wright (D-Wausau) who discussed their soon-to-be introduced redistricting reform legislation -- which CC/WI strongly supports. To watch a video of the comments of all of the legislators and questions from board members, go here. Over the last two years, Wisconsin – a state the eminent American Jurist and Supreme Court Justice Louis Brandeis characterized 100 years ago as the nation’s “laboratory of democracy” – has undergone tumultuous change in the way it conducts elections and considers public policy. As a result, the core political fabric of Wisconsin – once heralded as a national model – has been dramatically transformed. In 2011, Wisconsin experienced the most secretive, partisan redistricting process the state has ever seen – resulting in dramatically less competitive voting districts for both the U.S. House of Representatives and for the Wisconsin Legislature. Should redistricting be taken out of the hands of partisan legislators and put into the hands of a non-partisan entity to draw congressional and legislative voting districts before the next redistricting process in 2021? Tens of millions of dollars were spent by outside interest groups on advertising leading up to last fall’s general election. But the citizens of Wisconsin are still in the dark about who was really behind much of this avalanche of “outside” campaign cash and the constant barrage of interest group “phony issue ads” we saw during the election season. And what about Wisconsin’s photo voter ID law – arguably the most extreme and restrictive such measure enacted into law in the nation in 2011? For now, it has been blocked by the courts. But is it needed? Is there really voter fraud or is this a voter suppression measure? History Professor Beatrice McKenzie of Beloit College will serve as Moderator. 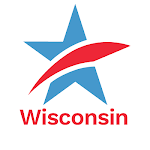 Two recently retired Wisconsin State Representatives were elected to serve on the Common Cause in Wisconsin (CC/WI) State Governing during the most recent meeting of the board in late February. Donna Seidel of Wausau, represented the 85th Assembly District from 2005 to 2013. Kelda Helen Roys of Madison, represented the 81st Assembly District from 2009 to 2013. Donna Seidel, a Democrat, was a candidate for the Wisconsin State Senate in the 29th State Senate District in the recall election of June, 2012. She is a Neenah native. After graduating from the University of Wisconsin - Stevens Point in 1972, Seidel began her career as a police officer with the Wausau Police Department. She later joined the Marathon County District Attorney's Office responsible for sexual assault and abuse investigations as well as victim/witness advocacy. She then served 16 years as Marathon County Clerk of Courts before being elected to the State Assembly in 2004 where she served until January of this year. Seidel has been involved in numerous community organizations, serving on the boards of United Way, The Womens' Community, Festival of the Arts and as a member of the Northcentral Technical College Board of Trustees. "My entire career has been devoted to working with and for communities throughout this great State. I'm excited to now be part of the Common Cause in Wisconsin State Governing Board and have the opportunity to continue these efforts," Seidel said. "Reforming political campaigns and elections in Wisconsin is fundamental to restoring citizen confidence in state government and democracy. Wisconsin was once the envy of the nation in the way that we conducted our elections and the public-policy process that followed. No longer. I want to help CC/WI work to restore a bipartisan consensus about the necessity of having honest, accountable government in our state," Seidel added. Roys, a Marshfield native, is a longtime advocate and community leader. An attorney with Wheeler, Van Sickle & Anderson, S.C. in Madison, she recently finished serving two terms in the Wisconsin State Assembly, where she served as Democratic Caucus Chair and Ranking Member on the Committee on Elections and Campaign Finance. Prior to her becoming the youngest legislator in Wisconsin, Kelda was executive director of NARAL Pro-Choice Wisconsin. In her recent campaign for the U.S. House of Representatives, she refused to accept corporate PAC funding and spoke out boldly for comprehensive campaign finance reform. Roys said: "I'm honored to join the bipartisan Common Cause in Wisconsin State Governing Board. Leaders on both sides of the political spectrum recognize that, to function effectively, our democracy must limit the corrosive influence of money in politics, expand transparency and accountability in government, and ensure fair elections and broad participation." "I know firsthand how our current system of privately financed elections discourages good people from running for office, and makes it challenging for elected officials on either side of the aisle to achieve their public policy goals. Common Cause in Wisconsin is a much-needed bipartisan voice in the Capitol for common sense reform and good government," she concluded. A former Republican Cabinet Member and a former Republican State Senator are slated for election to the bipartisan CC/WI board this Spring and Summer. Bill Lueders column: Are former lawmakers cashing in?